Since so many of my new blog readers are also new to nut allergies, I wanted to expand on my recent post that discussed some basic ways of coping with a new food allergy diagnosis. I've been thinking a lot about this topic for the last few days and considering what has helped me the most as I began learning about life with food allergies. Be ready for your world to be rocked. Severe food allergies make you look at nearly everything you do with fresh eyes. Food is so ingrained in our traditions, social events and emotions that you may be surprised at how much food plays a role in your life. Things are going to change for your family, that's for sure. However, all of the changes won't necessarily be negative. As I said in my previous post, my whole family eats healthier now. 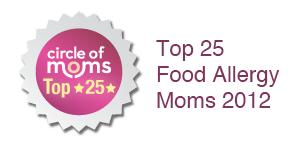 However, knowing that common foods have the potential to harm your child can make the entire world seem unfriendly at times. Don't be surprised if you feel a lot of strong emotions that you need to discuss with family, spouse or friends. If you really feel overwhelmed and it's interfering with your life, seek professional counseling. Give yourself time to adapt. You may feel apprehensive about certain situations once you know you are dealing with a severe food allergy, so don't push yourself. Knowledge on how to cope with restaurants, school, play dates and family members will not come to you overnight. It's OK to feel scared or confused. 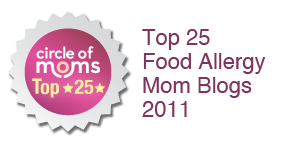 As you learn more about food allergies and manage situations successfully, you will gain confidence. But don't expect this to happen immediately. You need time to accept the situation and learn what works and what doesn't before you can begin educating others about it and advocating for your needs. Always have safe foods on hand--and bring them wherever you go.Food is pushed at kids almost constantly (many of you know this already) so don't get stressed, be prepared. If you are heading out with your child, be sure to bring safe alternatives so that you are not tempted to offer unsafe food simply out of hunger or desperation. Don't forget the epinephrine.If you're like me, you switch bags or purses, rush around in the morning or are simply human and sometimes forget stuff. Epinephrine is so important, however, that I've turned around and come home rather than go anywhere without my daughter's epinephrine autoinjector. Leave Post-It notes by your front door or on the dashboard of your car, get your child a special fanny pack or medication carrier but find ways to remember the epinephrine. It won't help anyone if it's sitting at home in a cabinet; epinephrine autoinjectors can and do save lives. Teach your child how to handle the allergy on their own. Parents are sometimes terrified of this, but if your kids are going to live a healthy life they need to learn how to be their own advocates. Role play situations, discuss unsafe foods and activities and if they are old enough (discuss when is the right time with your allergist) teach them to self-administer their autoinjectors. Kids who can advocate for themselves are more confident and happy kids as well as a safer ones. Embrace cooking and baking from scratch. Not everybody loves to cook but once you deal with food allergies it's actually more stressful not to cook. Why? Because when you frequently visit restaurants or pick up take-out you don't have control over what's going into your food--and that can mean risk of allergic reaction. Plus, cooking at home is healthier overall (and not just lower-risk for food allergies)and its more economical, too. If you don't have tons of time to cook on busy week nights, then cook what you can on your less busy days and freeze meals in advance. 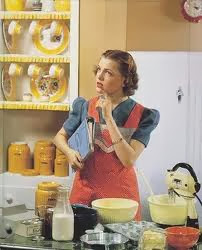 Also, be sure to have one or two quick go-to meals in your recipe arsenal and keep the main ingredients on hand at all times. Be cautious but enjoy your life. This is what our first allergist told us and he was right. You can't stop living because you now deal with a severe food allergy. That's not to say you should take unnecessary chances on food or downplay the seriousness of the situation. However, if you go forward in a positive way, you will affect the outlook of your entire family. If you are the parent of an allergic child, you want them to be happy and live life to the fullest, even though you may worry about them. Adapting to food allergies can mean having to alter how you go about some things, but don't let it limit you (or your child, whoever has the allergy) too much. This came at the perfect time, thanks. Still overwhelmed and stressed but it highlights some good things of which not to lose sight. What do you do when it's your family members that refuse to listen about the allergy......and get mad when you take steps to ensure your kid's safety and say you're dwelling on the ana reaction/hospital trip b/c you do what ya gotta do to keep them safe? To the last commenter: your question is an excellent one and it is something that I hear from many people and have also experienced. It really deserves it's own blog post but here is the short answer: you are as gracious to them as you can be but if they refuse to accept it, then you can't be around them and food until they do. You can also ask them to consider the facts: food allergies can kill and there is no cure for them. Avoidance of certain foods is the only way to ensure health and safety. Keep doing what you are doing and try to stay calm. You are not to blame and I've found that fighting about this accomplishes nothing. Your job is to protect your child and if people don't like that, too bad. Unfortunately, dealing with a chronic medical condition, especially one involving food, can uncover tensions that are simmering just under the surface of many relationships. I wrote an essay for the upcoming FAAN (www.foodallergy.org) newsletter about people who don't "get" food allergies. If you are not yet a member of FAAN, I'd encourage you to join. You can find a lot of support there. 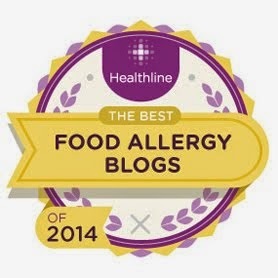 You can also check out www.allergicliving.com--their current issue takes on relatives who refuse to accept food allergies. It's a great article!